So it’s been a couple years I think since I did a Friday Craft post! Planning for specific crafts is not a strong area for me. I am much better at fostering an environment that promotes and provides for creativity, and my children are constantly crafting on their own. But, there is something to be said for a craft orchestrated by mom, and enjoyed by the whole family. I do have quite a few crafts in the queue right now, most of them at Larkspur and Keats’ request. So, it may be that I bring back Friday Craft posts here and there. 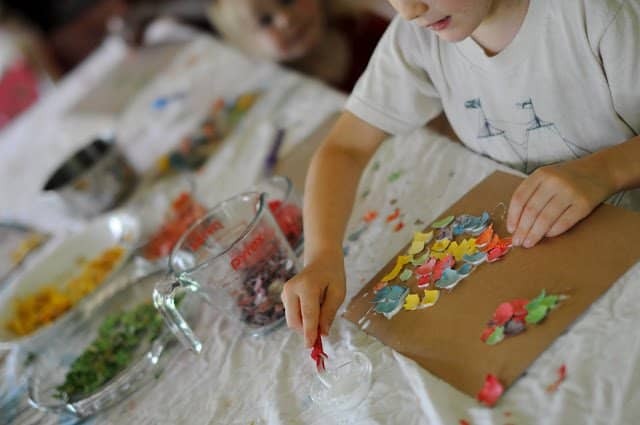 We got the idea to make eggshell mosaics from Emma Hardy’s Green Crafts for Children. However, I tend to take most craft ideas and transform them into an activity that focuses more on the process than the product. We began by saving eggshells for a few days, washing them, and letting them dry.